Answer: It’s already happened, not like there was anything special to see. 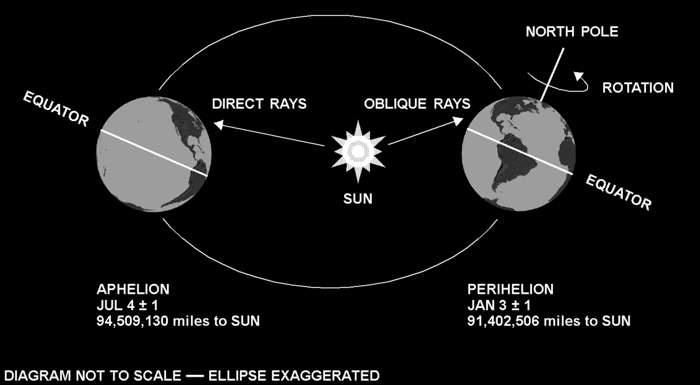 This event is known as perihelion, the point in its orbit where Earth is closest to the Sun, and it occurs on Jan 3rd ± a day. Earth’s orbit around the Sun isn’t a perfect circle. It’s an oval shaped curve mathematicians call an ellipse (diagram), but just barely so. The ellipse in the diagram is exaggerated for clarity. If I drew the precise shape, it would appear as a perfect circle to most eyes. Although the absolute difference in distance to the Sun varies by 3,106,624 miles, which sounds like a lot, that’s only a change of 3%. What really makes it colder this time of year is the more oblique rays of sunlight, which are not as effective at warming our northern hemisphere as they are 6 months later in July. You may well ask, does that mean the southern hemisphere has slightly warmer summers, since they’re getting the direct rays now in January? All things being equal, yes it would, but things are not equal. Turns out the greater amount of ocean in our southern hemisphere acts to moderate that change, since water can store a lot of heat. The seasons happen because of Earth’s gyroscopic stability. Its 24 hour spin keeps the north pole fixed in space as it orbits the Sun. That’s why the angle of the Sun’s rays changes.